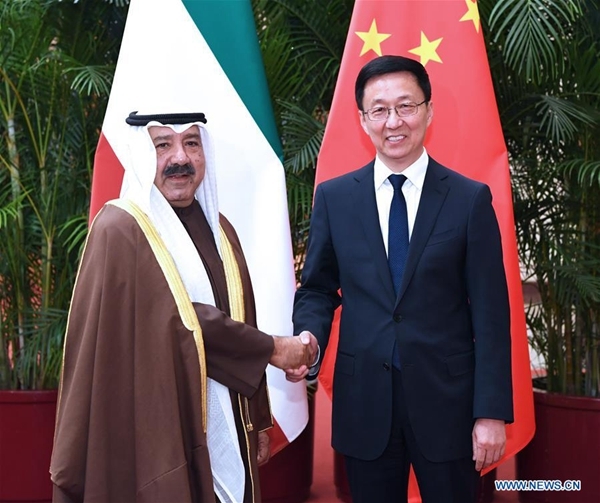 Chinese Vice Premier Han Zheng Monday met with Sheikh Nasser Sabah Al-Ahmad Al-Sabah, Kuwaiti first deputy prime minister and defense minister. He called on both sides to "implement consensus reached by both heads of state to enhance political mutual trust, strengthen alignment of development strategies and promote the Belt and Road construction." "Kuwait admires the remarkable achievements China has scored under the reform and opening-up policy," Nasser said. "Kuwait looks forward to learning from China's state governance experience and stands ready to participate in the Belt and Road construction."